After significant research and development, we are delighted to announce the introduction of AVLC (Adaptive Visual Lossless Compression), which offers true 4K HDR and Dolby Vision support over HDBaseT. 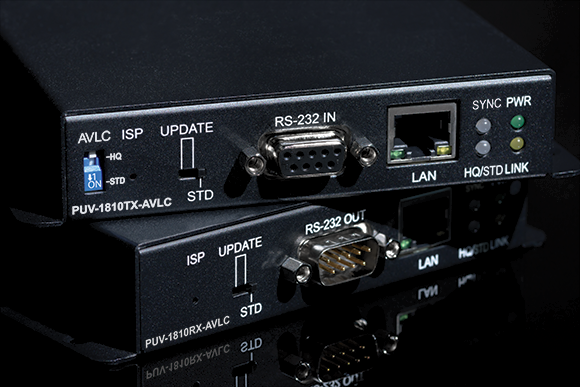 With the launch of our latest HDBaseT extender kits – the PUV-1810TX-AVLC/PUV-1810RX-AVLC and PUV-1710LTX-AVLC/PUV-1710LRX-AVLC – installers can now transmit true 4K/UHD video up to 70 metres over Cat 5e/6/7 cable. A truly ground breaking technology, AVLC takes the original 18 Gbps HDR signal and compresses it within the AVLC HDMI chip and presents the HDBaseT technology with a pre-packaged 10.2 Gbps stream it can transmit without issue. Unpacking the other end is also carried out by the AVLC HDMI chip, faithfully rebuilding the signal up to its full 18 Gbps original form, leaving the HDBaseT technology alone to do what it is best at – transmitting signals over long distances via Cat 6 cable. The adaptive part of the technology is very clever. The transmitter can recognise what data speed the source device is outputting and then alter the transmitting bandwidth required for the best performance. Therefore, any outputted signal falling under 10.2 Gbps will be transmitted along the HDBaseT installation in its native form. AVLC technology supports both Video Compression and Colour Space/Deep Colour reduction. AVLC can auto detect the incoming signals resolution, colour space, colour depth and communicate with the connected Sink device and automatically select the best way to reduce the bandwidth. AVLC has no video latency. To be one of the first to fully experience AVLC technology, contact our sales office. ** To see a preview of the wide-range of CYP products that will be introduced during 2018, visit our stand at ISE 2018 - Hall 5 / Stand Number U50.